We had always had the idea of recording a CD, and when the time finally came, we knew we wanted the final product to be something special for each of us. 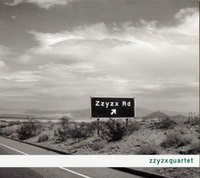 The CD title, "Zzyzx Rd" has a number of meanings. Clearly, it represents the actual road in the desert, which is our namesake, but it also represents our journey to this point in time. It has been an exciting and rewarding road to travel, so it seemed fitting to call the CD "Zzyzx Rd." The repertoire selections we made for the recording are all pieces that are important to us as a group, for a variety of reasons. 'Tango Virtuoso' was one of the very first pieces we played together as a group, and has since become one of our favorites in performance. It seemed only natural to start the CD with this piece, which is were it all started for us as a group. Ida Gotkovsky's 'Quatuor' is a monumental work for saxophone quartet, and one that is played often. The interesting thing about this quartet is that there is an optional solo part for the fourth movement, creating a quintet. This was the perfect opportunity for us to invite our teacher and mentor, Dr. Otis Murphy, to join us in this project. Dr. Murphy worked with us extensively in our first year together as a quartet, when we were all students at the Indiana University Jacobs School of Music, and it was a real honor to play with him on this recording. 'KLONOS' is a piece each of us had played in its original version for saxophone and piano, and the idea of playing this work as a group was very exciting. We are very pleased to release the first recording of the arrangement for saxophone quartet, done by the composer, Piet Swerts. The final two selections are works written for Zzyzx, by our friends John Leszczyski and Erik Norman. 'They Might be Gods', by John Leszczyski is a piece that is very exciting and sarcastic, and just a bit profane. The composer knows each of us, and our personal playing very well, and clearly took this into account when writing the piece. 'Suite' by Erik Norman was written for Zzyzx at the request of Dana Booher, a long time friend of the composer. The rhythmic drive, harmonic relationships, and melodic writing all suits the quartet very well, and features each voice in a different way.